Opinion polls suggest that as many as 90% of the UK population support donation and transplantation but the family consent and authorisation rate hovers around 60%. This shortfall perhaps reflects the difference between what an individual might wish to happen after their death and the reality that faces a grieving family. An increase in consent/authorisation rates to 85% would deliver almost 500 additional donors annually, and as a result is widely regarded as the element of the donation pathway most in need of improvement. It is also an element that for most parts of the UK has hitherto proven stubbornly resistant to change. There are three broad and complimentary approaches to increasing consent rates for organ donation – alteration of the way in which donation is raised with a family, promotional behaviour change strategies that seek to improve the public's support for donation and legislative reform that might 'reset' societal expectations. A system of 'deemed consent' for organ donation was introduced into Wales in December 2015; for more information on this click here. 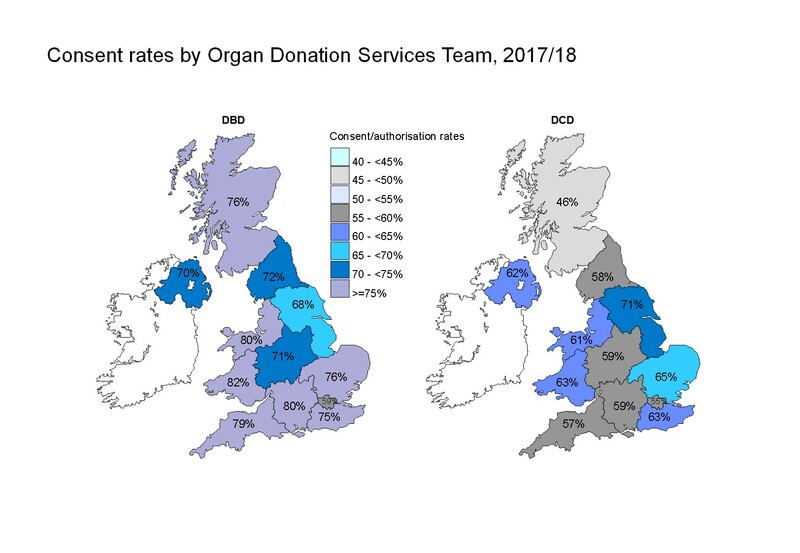 Figure 1 UK consent/authorisation rates for Donation after Brain-stem Death (DBD) and Donation after Circulatory Death (DCD). Click here to view the image full size in a new window. Family refusal rates are the biggest single identified obstacle to organ donation in the UK. Interventions to reduce refusal rates should be a priority for all donation committees and collaboratives. If the introduction of an opt-out system into Wales proves successful, it is possible that similar frameworks may be adopted elsewhere in the United Kingdom. NHSBT has recently commissioned a Best Practice Guidance that compliments the recommendations from NICE. This guidance advises that whilst there may be occasions when a consultant may have to request alone, that as a standard of best practice the family approach should be a collaborative effort between senior medical staff and the specialist nurse for organ donation. The three stages of the family approach. Wherever possible the Specialist Nurse - Organ Donation (SN-OD) should be involved in all three stages. It is important that there is agreement in advance on who will cover each element of the process and where the transition in responsibility will be. A common approach would be for the Consultant, ICU nurse and SN-OD to meet the family together, and for the Consultant to lead on breaking bad news and to then invite in the SN-OD to take over when it is clear that the family have accepted the inevitability of their loss and are ready to consider what may happen next. Any other healthcare professional, by phoning the NHSBT Duty Office. Visit the contact page for more details. Address including Post code or NHS / Community Health Index No. The Duty Office may phone back via Hospital switchboard to confirm identity and location of caller. If required, the Duty Office can fax a copy of the Organ Donor Register entry to the donating Unit, in order to facilitate conversations with family members. the individual leading the family approach must be competent to do so, have the requisite knowledge to answer any family questions and have the time to take the family through what can be a lengthy process. November 2015 - NICE has published interventional procedure guidance on living-donor liver transplantation IPG535. How can family consent/authorisation rates be improved? It is tempting to believe that the solution lies exclusively with public promotion and societal engagement. However there is also evidence that the way in which the possibility of donation is presented to a grieving family can have a critical impact – both positive and negative - upon the decision that they make. It is particularly important that families are approached at the appropriate time, in the appropriate fashion and by someone with the appropriate skills. The legislative framework for donation in England, Scotland and Northern Ireland is that of a hard 'opt-in' system of consent. The Human Tissue Act 2004, which governs practice in England , specifically uses the term 'consent', whilst The Human Tissue (Scotland) Act 2006 uses the term 'authorisation'. Practice in Northern Ireland is governed principally by common law, although broadly it follows the legal principles that are applied elsewhere in the United Kingdom.